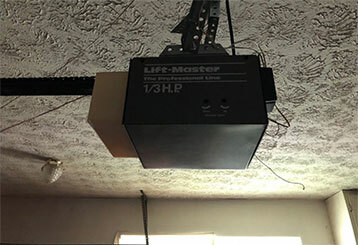 Garage door openers today have become a convenience we can't live without. But how do you know when it's time for a replacement? Read on to learn more about your opener and some common examples of malfunction. Whether you have a chain, belt or screw drive opener, it may start to malfunction when you least expect it. If it makes a grinding noise, the main gear inside the motor unit might be starting to fail. Motor failure is a more serious problem. If the damage is beyond repair, count on us to replace your motor with a new one. We'll make sure the replacement unit comes with sufficient horsepower to operate your door. A bowed rail is an issue which should not be underestimated. If you're dealing with this problem, our team can straighten it and eliminate the likely underlying cause of the problem - an improperly set closing force. With the accurate adjustment of this setting, you shouldn't experience this kind of trouble again in the future. A typical opener system utilizes a variety of additional controls, from remotes to wireless keypads. If you're struggling with any of these components, you can rely on our team for professional repair or replacement services.will open by itself after you have closed it. Report the problem as soon as you notice it and we will give you a new clicker which works properly. If you receive a new clicker from us, we will program it for you so that it's ready for use right away. Keep in mind that when there is a short in the remote, it will emit a signal constantly - as a result, your door may open by itself after you have closed it. Report this problem as soon as you notice it and we will give you a replacement clicker which works properly. Are you planning on an entirely new opener system? Our company’s got you covered. We install belt, screw and chain drive openers with precision. Whether you've decided to get an advanced unit with internet connectivity or a basic one, you can expect it to work reliably and safely from day one. From adjusting the settings to programming the remotes, we take care of everything. Our installation service also includes a full consultation to help you choose between the different openers available on the market. We'll help you choose the right unit for you - get in touch with our team at Garage Door Repair Justin today.